Home :: Put My Homebrew Beer on Tap! Put My Homebrew Beer on Tap! If you are a homebrewer or you have a homebrewer in your close circles, you know just how much bottling is a dreaded chore. Cleaning, sanitizing, drying, priming, filling, capping all those bottles... ughhh. But, what if you just had one big bottle? Well, that's pretty much what it is like to have a Homebrewers CO2 System. The bottling (kegging) process is done in just minutes. Add to that, you can force carbonate and be drinking your beer in two days! 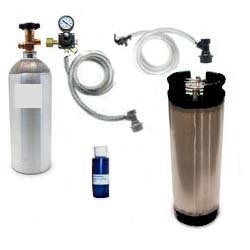 The Homebrewers CO2 Systems we sell has all you need to start kegging right away. You just have to get the CO2 tank filled. (Check your Yellow Pages under ''Gas"). 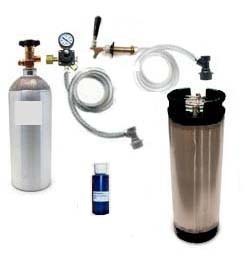 Have a look at how easy it is to keg, force carbonate and dispense your beer. If you plan on getting a refrigerator or freezer for use with your system, you may want to have a look at this help page. 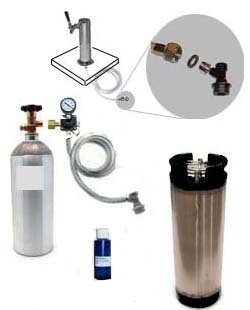 The Basic Homebrewers CO2 Systems are the most economical and portable kits. You can house them in a refrigerator for home use and drag them out to a party with ease. Have a look at our Basic Systems. The Refrigerator Homebrewers CO2 Systems are built so you can convert a old or new refrigerator into a home draft dispenser for your homebrew. They have shank and faucet assemblies the perfect length to go through the door. Have a look at our Refrigerator Systems. These have Towers the to go through the top of your freezer or small refrigerator. Have a look at our Refrigerator Systems. This Kit is for those who have bought a Kegerator that did not come with a tank, regulator and tap. There are several options for the taps or disconnects, from Domestic to European and even Soda Keg setups for home brewers. All are interchangeable, they just screw on and off the factory coupling nuts.